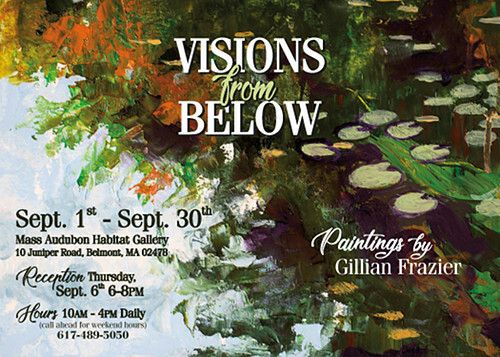 :: Sponsored by: Berkshire Botanical Garden, Vermont College of Fine Arts, Kingston Gallery, George Marshall Gallery, Rocky Neck Art Colony, Solomon's Collection and Fine Rugs, Augusta Savage Gallery, Hampden Gallery, University Museum of Contemporary Art, Mass Audubon, and the Artscope Tablet Edition. This week we're presenting Pingree School, Yale University Art Gallery, and Brookline Arts Center with exhibitions that strongly encourage viewer participation and involvement. There are also other interesting and exciting events happening soon for those who want more. 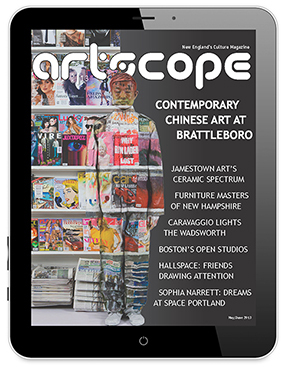 Artscope is sponsoring Portland Fine Craft Show hosted by Maine Craft Association this Saturday, August 25 from 9:00 a.m.⎻4:00 p.m. The show is located at Congress Street between High and State Streets, in Portland, Maine and will be free and open to the public. There will be over 100 juried exhibitors from across New England displaying a wide variety of fine craft, including ceramics, fiber, glass, jewelry, metal, paper, stone, and more. Take a look and see the skill and talent of dozens of artists! Fuller Craft Museum is hosting their fundraiser Members Create: Celebrate! on September 15 from 6:00 p.m.⎻9:00 p.m. There will be food, conversation, guided tours, art available for purchase and more. Reserve your spot by Wednesday, September 5. Tickets are $60 and can be bought here. Seating is limited, so don't wait! Artscope is sponsoring Fruitland Museum's current exhibition "Leisure Pursuits," which displays antique dresses and accessories from the past 125 years of Massachusetts history. The exhibition will be on view until March 24, 2019, so there's plenty of time to see it! Mark your calendars for "Beyond the Pedestal: Isamu Noguchi and the Borders of Sculpture," an exhibition on view at Portland Museum of Art from October 5, 2018 through January 6, 2019. This exhibition, sponsored by Artscope, explores the bold and challenging sculptures of Japanese-American sculptor Isamu Noguchi. Be sure to give it a look once it comes out! Philip Marshall, Fruit of Fancy. "The Flying Horse Outdoor Sculpture Exhibit" will be on view at Pingree School's campus from September 1 until November 4. 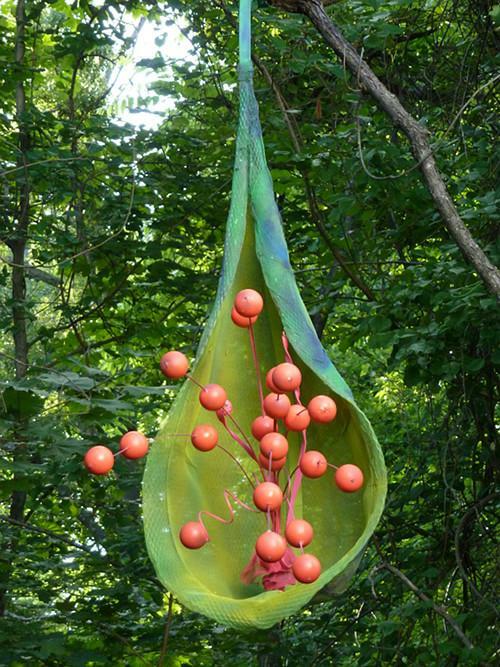 This is the ninth annual "Flying Horse Outdoor Sculpture Exhibit," and over the years this exhibition has become one of the largest temporary outdoor displays of sculpture in New England. This year's exhibit will feature more than 50 installations submitted by artists from New England, California and New Mexico. The sculptures are constructed from various types of materials, such as wood, glass, bronze, recycled metal, fiberglass, and many others. Some of the sculptures are even interactive, like the Pickup Music Project's installation of a 25-foot musical fence. There will be a reception with the artists on Sunday, September 16 at 1:00 p.m. George Fifield, the executive director of Boston Cyberarts, is this year's honorary chair of the exhibition and will be speaking at the reception. Pingree School is located at 537 Highland Street in South Hamilton, Massachusetts and the "Flying Horse Outdoor Sculpture Exhibit" will be open seven days a week during daylight hours. For more information, please visit pingree.org/flying-horse-outdoor-sculpture-exhibit. 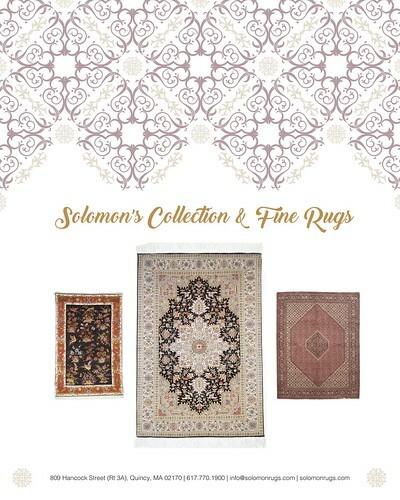 Sponsored by: Berkshire Botanical Garden, Vermont College of Fine Arts, Kingston Gallery, George Marshall Gallery, Rocky Neck Art Colony, Solomon's Collection and Fine Rugs, Augusta Savage Gallery, Hampden Gallery, University Museum of Contemporary Art, Mass Audubon, and the Artscope Tablet Edition. Fitzhugh Karol, Pulse, 2013, from Beautiful Strangers: Artists Discover the Garden. 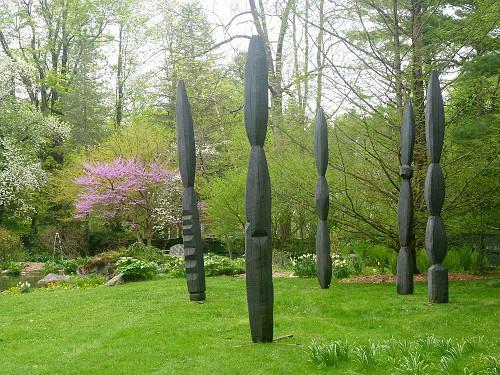 ART/GARDEN⎻featuring Beautiful Strangers, an exhibition of contemporary sculpture throughout the Garden's 15-acre grounds, and Ellsworth Kelly's iconic plant lithographs in the Center House Leonhardt Galleries. Berkshire Botanical Garden is located in the heart of the Berkshires and is open daily, 9:00 a.m.⎻5:00 p.m. Docent-led and self-guided audio tours available free with garden admission. For discount admission information click here. Use code BBG18 for a $2 admission discount. Children under 12 are admitted free of charge. Applications are now open for Vermont College of Fine Arts MFA in Visual Art Winter 2019! We are also excited to announce the new Distinguished Artist scholarship, awarded to two new students starting the program with the winter 2019 semester, supporting half of each awarded student's tuition. Find out more today! 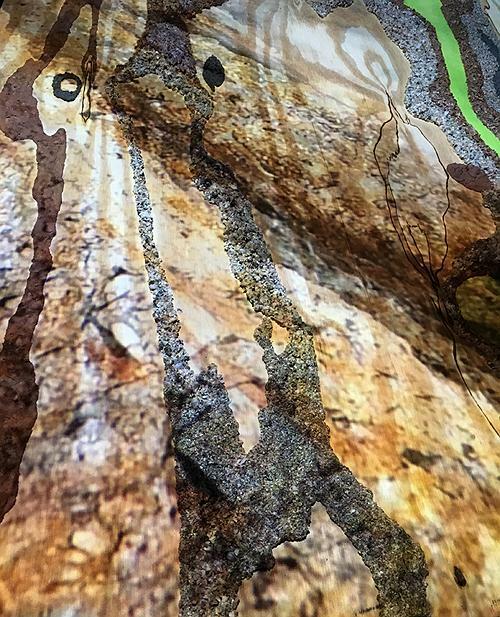 Luanne E Witkowski & Denise Marika, Strata (detail), video projection, plywood, sand, 39.5" x 64" x .75", 2018. Opening Reception: Friday, September 7, 2018, 5:00 p.m.⎻8:00 p.m. 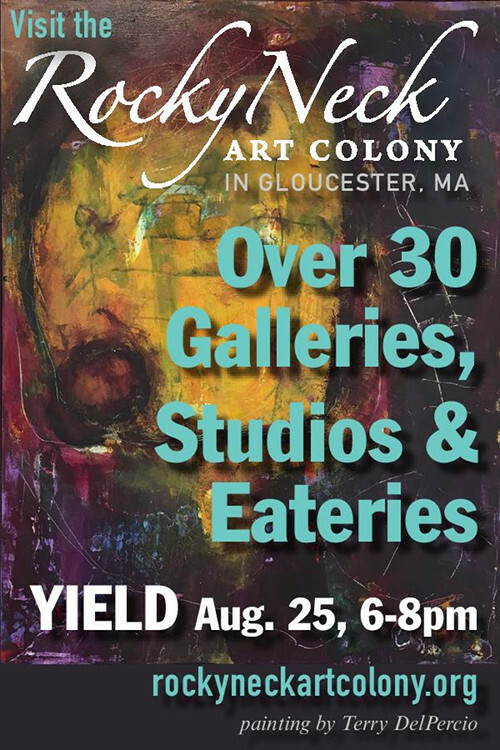 Artist Discussion, Saturday, September 22, 2018, 3:00 p.m.
See YIELD, a new exhibition at the Cultural Center Gallery at 6 Wonson St., Gloucester. Reception Saturday, August 25, 6:00 p.m.⎻8:00 p.m.
See Layerings and Landings, at Gallery 53 at 53 Rocky Neck Ave., Gloucester. For a map and more info visit rockyneckartcolony.org. Leonardo da Vinci, The Annunciation (detail), ca. 1475⎻79. Oil on panel. Musée du Louvre, Paris, inv. no. M.I. 598. Photo: Centre de Recherche et de Restauration des Musées de France (C2RMF), Jean-Louis Bellec. On view at the Yale University Art Gallery is "Leonardo: Discoveries at Verrocchio's Studio" until October 7. The exhibition looks at the work known to have been created in the teaching studio of the sculptor, painter, and goldsmith Andrea del Verrocchio during da Vinci's early apprentice years along with fellow pupils. 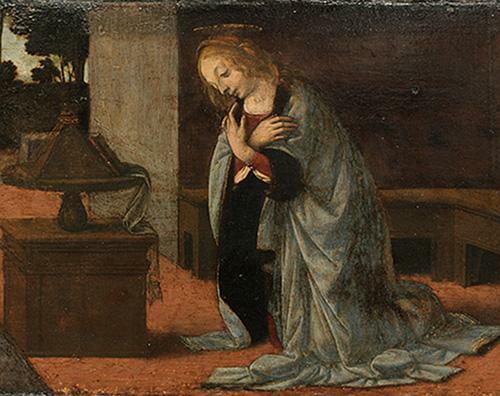 A variety of paintings and sculptures are on view including a pair of predella panels⎻The Annunciation, from the Musée du Louvre, Paris, and A Miracle of Saint Donatus of Arezzo, from the Worcester Art Museum, Massachusetts⎻that once belonged to a large altarpiece, the Madonna di Piazza, in Pistoia, Italy. With each piece the viewer is encouraged to look closely to see da Vinci's hand. The exhibition offers different points of comparison to shed light not just on da Vinci's early work, but on the work of the lesser-known artists that Leonardo da Vinci collaborated with. Yale University Art Gallery is located at 1111 Chapel Street between York and High Streets in New Haven, Connecticut and is open Tuesday⎻Friday 10:00 a.m.⎻5:00 p.m., Thursday 10:00 a.m.⎻8:00 p.m., and Saturday⎻Sunday 11:00 a.m.⎻5:00 p.m. For more information, please visit artgallery.yale.edu/leonardo-discoveries-verrocchios-studio. Dave Bermingham, Occhi (detail), 2017. Brookline Arts Center's first annual Echo Trobridge Artist Residency is currently being held from now until September 21. 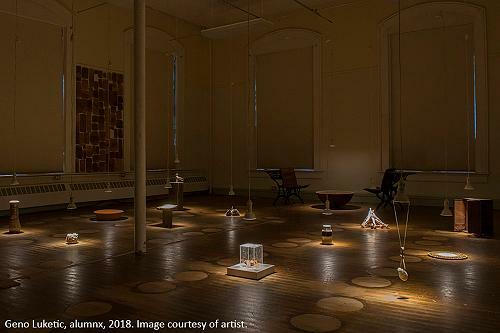 The Echo Trobridge Residency was named in honor of Brookline Arts Center's first artist in residence, Echo Trobridge, and is supported in part by a grant from the Brookline Commission for the Arts. 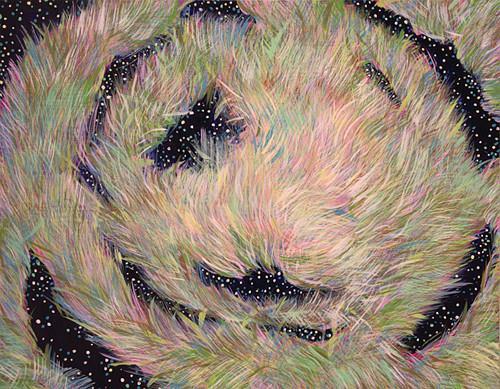 The featured artist of this residency is Dave Bermingham, a prolific artist who's been featured in galleries across the country and has taught in several Massachusetts colleges. 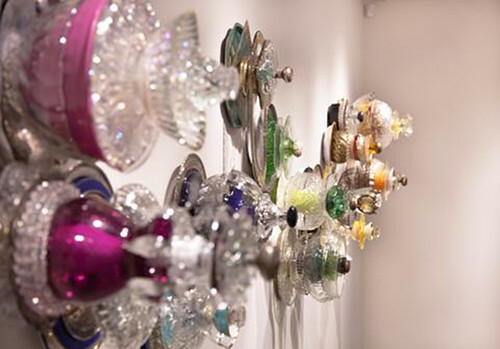 At Brookline Arts Center, he's been creating a site-specific installation based on his "Occhi" sculptures. These sculptures, made of discarded plates, platters, and dinnerware, are centered on concepts of superstition and desire. Bermingham invites the community to contribute similar objects of their own to be incorporated into the exhibition. Bermingham is also working on a new body of work titled "Cant Slang," creating pieces that blend poetry, Morse code, beading and sculpture. Once completed, the public will be invited to a workshop version of this project. Both ambitious projects in "Echo Trobridge Artist Residency" are sure to be worth the wait. Brookline Arts Center is located at 86 Monmouth Street in Brookline, Massachusetts and is open Monday⎻Friday 9:00 a.m.⎻5:30 p.m. For more information, please visit brooklineartscenter.com/gallery/artistresidency/davebermingham. 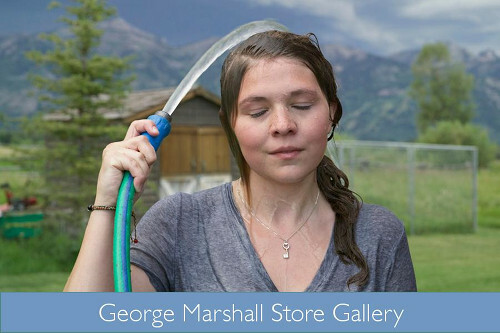 Opening Reception: Wednesday, September 5, 5:00 p.m.⎻7:00 p.m. 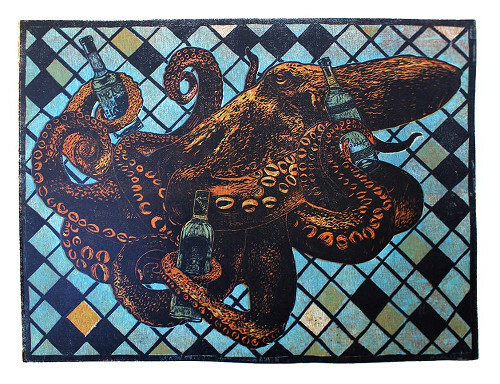 Opening Reception: Tuesday, October 2, 5:00 p.m.⎻7:00 p.m.
Group show by printmakers from Oaxaca, Mexico. ASG FESTIVAL, October 15⎻18, 7:00 p.m., free. 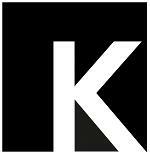 Series of poetry, spoken-word, music, film and more. Monday and Tuesday 1:00 p.m.⎻7:00 p.m.
Jenn Houle: Warm Nothingness, Acrylic on panel, 12" x 9", 2016. Holly S. Murray: Developing Crack, Oil on Russian Birch, 12" x 14" 2018. Opening reception: Sunday, September 16, from 2:00 p.m.⎻4:00 p.m.
Houle's installations create visually complex and contemplative spaces. 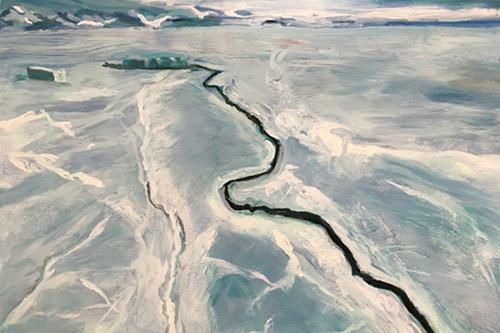 Murray's paintings depict the vast polar ice forms that are turning to salt water. 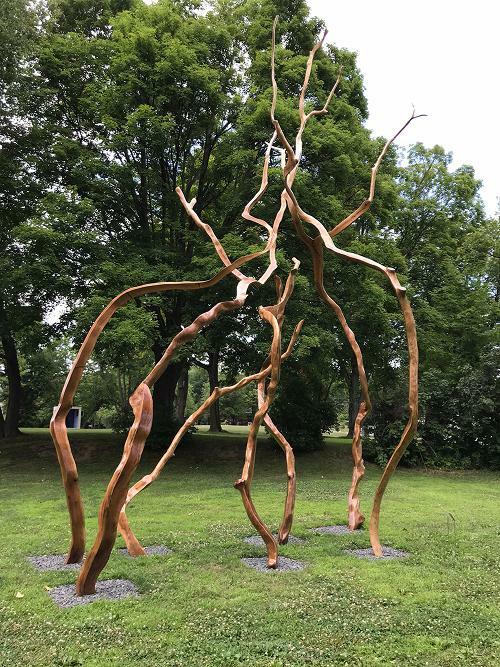 Tuesday⎻Friday 1:00 p.m.⎻6:00 p.m., Sunday, 2:00 p.m.⎻5:00 p.m.
For this public art exhibition, thirteen artists and architects created outdoor installations for the gateway district between downtown Amherst and UMass. In collaboration with the UMass Department of Architecture and the Town of Amherst.